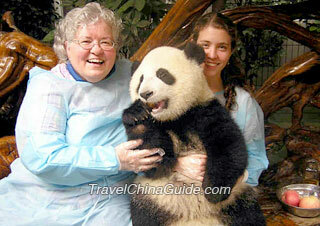 Everybody loves the giant panda! With its black-white coat, the adorable fluffy animal is one of the most precious animals in the world. It is native to China, proudly called the 'national treasure'. Apart from The Great Wall, Terra-Cotta Warriors, and Forbidden City, it has also become an important temptation to world-wide tourists. As the most well-known celebrity of China, it appears in the logo of the World Wildlife Fund for Nature (WWF), preeminently endorses the Olympics and many other international games held in China as a mascot, shows up as a versatile actor on the big screen, such as the Kung Fu Panda. Any animative movements of the giant panda will draw wide attention and generate happiness. They are cute and cuddly with cool eye patches and dopey gestures. There are many reasons why people love them and the most important one is that they are rare and endangered. It has been absolutely a perfect reason to embark on a panda adventure. Click FAQs to see more. The giant panda now only lives in a few mountain ranges in central western and south western China, mainly in Sichuan Province, and also available in Shaanxi and Gansu provinces. It is classified to be an endangered species by the International Union for Conservation of Nature (IUCN). According to the official report based on 1999-2000 census, There are 1,590 that live in the wild in their natural habitats. The number was pessimistically estimated as 1,000 several years ago. A new round of census has begun since the middle of 2011, and the number is expected to be updated very soon. Where to See them? Chengdu is the best place! The main captive breeding centers were built around this area. The Giant Pandas' mating season is only 2-4 days during March to May. If missed, they will wait till the next year. One female panda will usually breed only one baby, and it is not easy for wild pandas to have twins anyway. The lowered fertility generated the research on captive breeding. The China Conservation and Research Centre for the Giant Panda was established in 1983, jointly by Wolong National Reserve and WWF whose inspired from a panda named Chi Chi who was transferred from the Beijing Zoo to the London Zoo in 1958. The number of captive giant pandas reached 328 by the end of 2011. This is a great accomplishment. It was a French missionary, Armand David, who let the whole world know of this unique creature. He called it white-black bear. In 1963, an American fashion designer brought the first live giant panda to the western world. 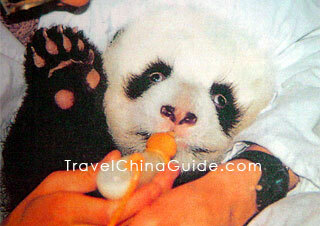 The giant panda is China's national treasure and was regarded as the symbol of valiancy and peace. Its diplomatic career is sparkling. In Japanese history records, the court of the Tang Dynasty (618 - 907) sent two bears and seventy pieces of fur as national gift to Japan. The 'two bears' were testified to be giant pandas. American President Nixon's visit to PRC in1972 brought huge fame to the giant panda. As far as I know, there are no pandas in Zhengzhou zoo now. Generally speaking, it can live up to 20+ years for a wild giant panda. And a captive panda can live more than 30 years. Because they are lazy and like sleeping. Why is panda famous in China? Pandas are Chinese national treasure and they are very cute. 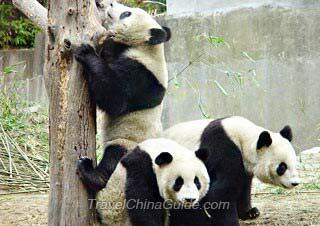 Which one of the places near Chengdu is recommended for visiting? Chengdu Research Base of Giant Panda Breeding or Bifeng Gorge Panda Conservation and Research Center? 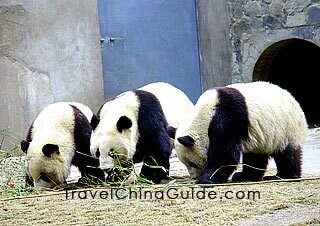 Dear Jonas, if you only want to see pandas, then Chengdu Research Base of Giant Panda Breeding is recommended. It is the nearest site from downtown Chengdu.